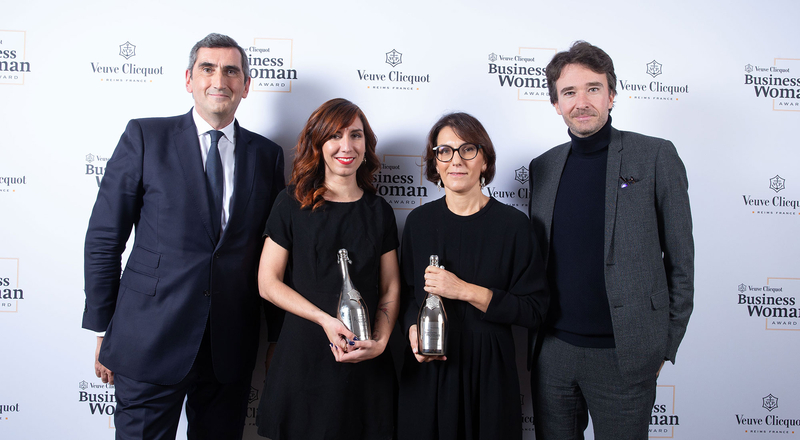 Veuve Clicquot presented the Veuve Clicquot Business Woman Award to Nathalie Balla, co-President of La Redoute and Relais Colis, and the Prix Clémentine “New Generation” Award to Shanty Baehrel, founder of Shanty Biscuits. The ceremony on November 15th was held at the Automobile Club de France in Paris, attended by numerous prominent business leaders and previous award winners. Madame Clicquot challenged codes and customs when she took the reins of the Maison in 1805 following the untimely death of her husband. She initiated a host of innovations that marked the world of champagne, including the riddling table and the production of the first known blended rosé champagne, which fetes its bicentennial this year. To pay tribute to her legacy, for its bicentennial in 1972 the Maison created the Veuve Clicquot Business Woman Award. Each year this trailblazing award honors exceptional women who are business leaders recognized for their success. In 2014 the Maison created the Prix Clémentine, named after Madame Clicquot’s daughter, to recognize women Veuve Clicquot sees as emblematic of the next generation of remarkable businesswomen. This year’s Veuve Clicquot Business Woman Award went to Nathalie Balla, co-President of La Redoute and Relais Colis since 2014, after previously serving as CEO. She has strong ties to the company and played a key role in relaunching it in 2014 alongside management and employees. Since then the company has swung back to dynamic growth momentum. Shanty Baehrel, winner of the Prix Clémentine, is the founder of her eponymous Shanty Biscuits brand, which makes and sells customized biscuits online. In 2013, the native of Aix-en-Provence received a biscuit stamp as a birthday present, giving her the idea for biscuits with personalized messages, giving the tasty treats special meaning. Word of mouth and viral success on Instagram quickly made her production facilities too small to support the company’s growth, as sales tripled annually. Congratulations to both winners and to all the finalists!